Maybe you saw the scene last week. The camera pans through a crowd of yellows shirts glued to screens mounted on the wall – Colombia is playing Poland in the group stage of the World Cup. The camera stops to rest on a table where two men sit around a makeshift field. The men are holding hands, moving them around the model field together – one man looking down, intently concentrating on the movement of the hands. The other man’s head swivels back and forth from the screen to the table. The text at the bottom of the screen explains what is happening – one of the men, Carlos Junior, is blind and deaf. The other is using a complex system of tactile communication designed to help his friend experience what he can’t see or hear. The ingenious system allows Carlos to follow the movement of the ball on the field – even small details like a shot on goal deflected by a cross bar, or the dramatic flop of a player to the ground. The atmosphere around the two men is electric. As the video closes, the bar erupts with the sounds of a Colombian “ggggooooolllll” and the sight of two elated men jumping up and down in each other’s arms. It’s a moving experience watching this act of friendship. The millions who have viewed it agree. It’s something that is hard to describe. It’s as if the joy of a man given the chance to forget his limitations and for a brief moment share in the revelry of the human experience around him is a tangible thing. It rises up out of the screen. It resonates through the air and into your soul. And the love in that moment? I’m not crying, you’re crying. Whence comes that feeling, that wetness on your cheek when you see something like this? Psychologists call that elevation, it’s the positive neurological and emotional effect of witnessing a kind or inspiring deed. In 2010 a group of scientists carried out a study to test a hypothesis about elevation. Psychologists Simone Schnall, Jean Roper and Daniel M.T. Fessler believed that people who witness uplifting scenes enter a state of elevation and are more likely to participate in what they call “pro-social behavior.” They are more likely to be decent human beings. They wanted to test what seemed to be an obvious idea against data. There were two phases of the test. Phase One. A group of participants were shown one of two video clips – the first a pleasant scene from a nature documentary. The second was an uplifting scene showing a kindly act. After watching one of the clips, participants were asked to volunteer to help with another study. Those who watched the uplifting scene were more likely to give away their time. The data concurred with the hypothesis – the elevated ones were the giving ones. Phase Two. On the way out of the lab, participants passed by a research assistant who appeared to be having trouble with a computer. The elevated participants spent twice as long as the other participants trying to help the assistant. Once again, a win for the hypothesis. Conclusion. Here’s the final word from the team: “these results provide evidence that witnessing another person’s altruistic behavior elicits elevation, a discrete emotion that, in turn, leads to tangible increases in altruism.” In other words, it only takes a small exposure to others doing good deeds to elevate your mood and motivate you to act unselfishly. Results like this suggest that a couple of minutes spent watching two friends taking in a football match has elevated the mood of millions of people in a way that substantially increased their likelihood of acting in kind and unselfish ways. How far that little candle throws his beams. Not only does the elevation that comes from witnessing an inspiring deed lead to more inspiring deeds, studies show that the experience has a significant effect on your body’s health. For example, a group of students asked to watch a video documenting Mother Teresa’s work in Calcutta experienced substantial increases in protective antibodies, providing a defensive boost to the immune system. This effect lasted for an hour after watching the video. Other studies show that exposure to good deeds produced elevated levels of oxytocin, a chemical which reduces stress and promotes healing. You’ve probably heard of the fight-or-flight response produced by adrenaline. Oxytocin is a balancing counterpart of adrenaline. It creates what scientists call the tend-mend response – it calms us and creates a sense of trust. Dr. Stephen G. Post, professor of bioethics at Case Western Reserve University, has been studying this effect for years. Post describes what he calls a ‘compassion-altruism axis’, a region in the brain that fires during moments of compassionate or empathetic emotions. When this part of our brain is active, it creates “a profound state of joy and delight”. It reinforces activity that fills the world with altruistic love. What Post has found is an uplifting, elevating cycle. You see a good deed and you feel better. You’re less stressed, you have a heightened awareness of the people around you and you’re more likely to act when you see them face a challenge. That action in turn makes you (and everyone else in the room) feel better, less stressed, more likely to help others, etc. 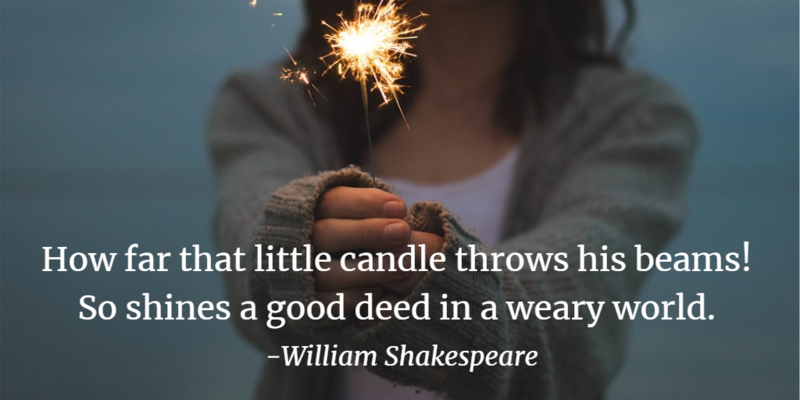 One good deed throws a far beam. For those of us with disability in the home, this is a familiar story. Elevation is a daily experience. It happens when I see my weary wife sitting on the bathroom floor at the end of a long day, patiently working towards her daughter’s independence. It happens when I see my insanely active sons slow down to carefully decipher their sister’s words and help her find the show she is looking for. 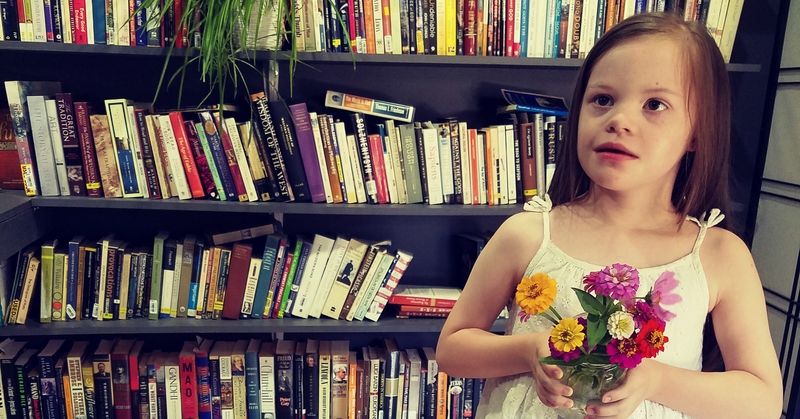 It happens when my little girl proudly walks into a room brandishing a handful of fresh picked flowers she collected for me. Every day in my home I see people happily give themselves away to help someone who has more needs than they do. I see a little person with all those needs courageously fighting to overcome her limitations and reach new heights. I practically live at a state of elevation, soaking in all of those life giving benefits that come with it. And here’s the thing – wherever Elizabeth goes, she brings that with her. Into a classroom, a reading group at the library, a church service or the grocery store – uplifting scenes follow behind her and the world around her is elevated. She is dropping her pebbles into the pool of humanity, sending ripples of compassion and empathy cascading out into the world. The data suggests that making space for people with special needs in the mainstream benefits the rest of us far more than it does them. They are helping us become healthier and more decent human beings and the immeasurable benefit is far outweighing the costs. The science is clear: inclusion of people like Carlos Junior and my little girl is changing the world. My child was diagnosed with a disability. What does that say about me? Will Down syndrome save humanity? Jared Fautt on My child was diagnosed with a disability. What does that say about me? Steven on My child was diagnosed with a disability. What does that say about me? Reba Nolan, Burkhalter on My child was diagnosed with a disability. What does that say about me? Copyright © 2019 Tom Brown · Site by Mere.